CARY, N.C. (August 9, 2018) -The North Carolina Courage (15W-1L-4D, 46 points) travel to Toyota Park in Bridgeview, Ill., this Friday, August 10 at 8:00 p.m. ET to take on the Chicago Red Stars (7W-4L-7D, 28 points). 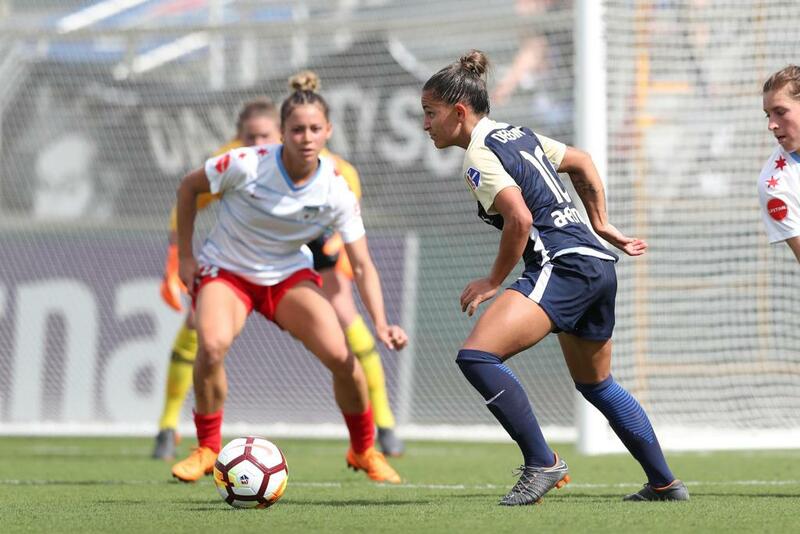 The NC Courage are coming off of a 2-1 NWSL Shield-clinching win against the Portland Thorns, where Lynn Williams recorded a brace to earn NWSL Player of the Week honors. The Courage’s 15th win of the season secured them the NWSL Shield for the second consecutive season. Jessica McDonald sent a long cross from the right side flank in the 37th minute, setting up Williams’ first goal of the game. Williams found the back of the net, again, just minutes later after a cross ricocheted off two Portland defenders. With two goals against Portland, Lynn Williams sits atop the Golden Boot race, tied with Lindsey Horan who scored Portland’s lone goal on Sunday. Jessica McDonald recorded her fifth assist of the season, which ties Crystal Dunn and three other league players for the second-most assists in the NWSL. The Chicago Red Stars have not played since July 14, nearly a month ago. They defeated the Seattle Reign, 1-0, thanks to an 87th minute goal by Sam Kerr. This match was only the Red Stars second match since last playing the North Carolina Courage on July 4. Last time around, the NC Courage defeated the Red Stars, 4-1 in an exhilarating matchup. Four different Courage players scored during that game before Chicago scored a goal in stoppage time. Lynn Williams has scored five goals since the last matchup with Chicago, including a hat-trick against Sky Blue FC on July 14. This will be the Courage’s first time playing in Chicago this season. Since relocating to Cary, the Courage are 2W-3L-1D against Chicago. The North Carolina Courage have clinched the NWSL Shield for the second season in a row. This guarantees the first-place seed in the NWSL Playoffs and home-field advantage. Despite being injured at the beginning of the season, Sam Mewis has played in 13 games this season. She started her seventh game of the season this past Sunday against Chicago, making it her first start for the team since June 16 against the Utah Royals. Mewis was called up to the USWNT during the international break where she earned minutes with the U.S., helping them win the Tournament of Nations. Mewis has three goals and two assists on the season. Mewis continues to grow stronger as the season progresses. Sam Kerr continues to succeed in Chicago, starting and playing 13 games so far this season. The 2017 NWSL Golden Boot winner keeps scoring goals in the 2018 season, with nine so far. She has taken 58 shots, 32 of which have been on target. She has also added a pair of assists this season. Kerr scored Chicago’s only goal in the 1-1 draw against the Courage on May 6.